Salt. It seems like a simple substance, and yet you may be shocked to learn not all salts are alike. Most people have heard the warning to avoid excessive salt intake because it causes hypertension. This is because your body recognizes typical table salt as a toxin, since processing has changed its chemical structure. Your body is trying to move it away from your heart as quickly as possible. This processing also depletes salt of important trace minerals. Instead, manufacturers bleach salt white and add chemical additives like MSG, sugar, and toxic levels of potassium iodide. The impacts on the human body are many, from water retention to accumulation of toxins in the intestinal tract to increased risk of stroke, heart attack and diabetes. But there is a better way. You body needs salt to function and survive, but it needs natural salt without chemical additives. 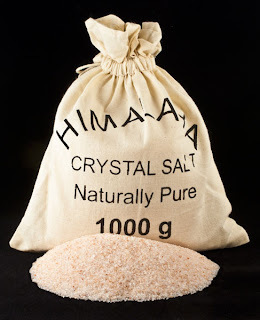 Himalayan crystal salt is sourced from centuries-old deposits, left by ancient oceans that have receded, leaving behind Himalayan natural salt. This Himalayan crystal salt is carefully mined by hand to preserve the crystalline structure and dried without high heat. This Himalayan salt for consumption comes without the harmful side effects of traditional table salt. Himalayan gourmet salt , sometimes known as Himalayan table salt, has 94 to 97 percent natural sodium chloride, like all food salt. The difference is that the remaining balance of 3 to 6 percent is made up of 84 valuable trace minerals, which can bring about health and wellness rather than damage to your health. 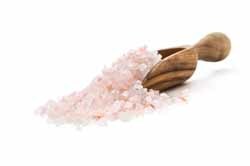 Instead of the bleached-white typical table salt, you will find Himalayan salt is pink becase of the natural trace minerals. Safeguard your health by including Himalayan crystal salt along with other organic health and wellness products in your daily life. Use Himalayan table salt in place of conventional salt, while reducing consumption of processed and packaged foods. Himalayan salt has other benefits, too. Use Himalayan salt inhalers or Himalayan salt lamps to improve respiratory conditions and neutralize damage from indoor air pollution. Or, use a Himalayan salt bath to naturally detox your body. The benefits of removing conventional salt from your life are many. But these benefits can be greatly multiplied by using Himalayan salt for consumption, as well as body detox and air purification. 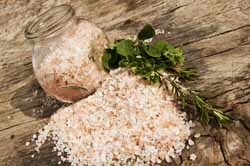 Shake the conventional salt habit and step into a healthier lifestyle by choosing Himalayan salt.